Embraer is a global company headquartered in Brazil with businesses in commercial and executive aviation, defence and security. Embraer claimed that the E-Jets E2 is the most efficient family of aircraft in the single-aisle market burning up to 10% less fuel than its direct competitor. Brazilian aircraft manufacturer Embraer's E190-E2 commercial jet, which is on a tour around the region, has made its landing in India. 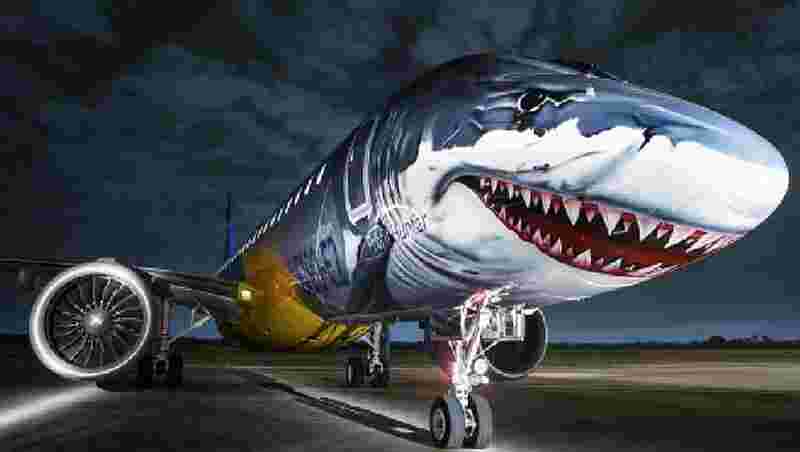 Sporting a shark livery to represent the aircraft’s ‘profit hunter’ status, the aircraft will offer Embraer’s guests a closer look at the world’s quietest, cleanest and most efficient new-generation single-aisle aircraft. "The E190-E2 offers airlines the benefit of lower operating costs and is capable of achieving similar costs per seat of larger re-engined narrowbody aircraft, with significantly lower costs per trip. We have also received a lot of positive feedback about the aircraft performance, low fuel consumption, sleek and modern interior and low cabin noise and we are excited to show it to a wider audience," said Cesar Pereira, Asia Pacific Vice President, Embraer Commercial Aviation. Delivered to its launch customer in April last year, and now operated by two airlines Norway’s Widerøe and Kazakhstan’s Air Astana, the E190-E2 has gained an appreciation for having final specifications better than the originally expected. "The E-Jets E2’s value proposition in the Asia Pacific region is its ability to enable airlines to sustainably develop more routes secondary or tertiary cities. These are routes that can potentially bypass the major metro airports such as Manila, Jakarta, Bangkok, New Delhi and Mumbai which are heavily congested. This enables airlines to achieve sustainable growth without being constrained by infrastructure bottlenecks while offering passengers improved services with more non-stop flights," claimed the airline. Embraer forecasts a demand for 10,550 new aircraft with up to 150 seats worldwide, worth USD 600 billion, over the next 20 years, more than 3,000 of which will originate from the Asia Pacific region, including China. Embraer claimed that the E-Jets E2 is the most efficient family of aircraft in the single-aisle market burning up to 10% less fuel than its direct competitor. The E190-E2 brings also more flexibility with a maximum range of up to 5,300 km or about 1,000 km longer than the first-generation E190. "In fuel consumption, the E190-E2 proved to be 1.3% better than originally expected, which represents a 17.3% improvement when compared to the first-generation E190. In terms of pilot transition, pilots of the first-generation E-Jets will need only 2.5 days of training and no full flight simulator to fly an E2," said the aircraft manufacturer. Flight test results also confirmed the E190-E2 to be better than its original specification in takeoff performance in hot-and-high conditions as well as short field takeoff, it said. "E190-E2 also becomes the aircraft with the longest maintenance intervals in the single-aisle market with 10,000 flight hours for basic checks and no calendar limit in typical E-Jets utilization," said the company. This means an additional 15 days of aircraft utilization in a period of ten years compared to the first-generation E-Jets, it added.